What does British pop artist Imogen Heap have to do with social change? Quite a lot, actually. At her recent Seattle show Imogen wrote an impromptu song onstage, using participation from the audience, and made it available for purchase on her website. All proceeds from the sale of the song will benefit a local charity. 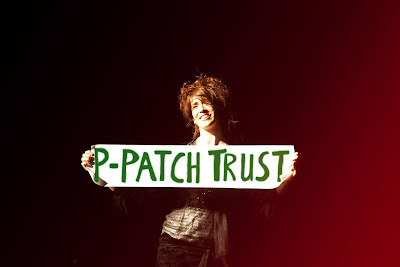 Seattle-area Imogen fans were afforded the opportunity to vote on a beneficiary, resoundingly selecting the P-Patch Trust. Though Immi, like myself, sits more squarely on the tail end of Gen X, she’s found a way to speak the language of the younger generation, tailoring each city’s set-list via online fan voting, and tweeting the latest tour news. I would venture to guess that it’s because of these opportunities for interaction that her fans are of the more die-hard variety (though her musical genius doesn’t hurt her any either). It comes down to this: Make people feel party to what you’re doing, create a feeling of ownership, and these feelings of inclusion will translate to action; in Imogen’s case, long door lines outside of sold-out venues and increased revenue for some great causes. Gen Y’ers (or Millennials, or Generation Nexters…) have gotten a bad rap for being “lazy” or “apathetic.” They’re accused of taking their rights for granted and caring more about American Idol than the politics of vital issues. I myself have been skeptical of virtual movements in the past, but have to admit that I've noticed some real success in recent technology-driven campaigns. The presidential campaign of Barack Obama comes to mind. How many concerts for change, Obama Mobile Message campaigns, and form emails did we see, that not only raised money for the campaign, but also motivated the younger generation out to the polls in record-breaking numbers? For those of you who are avid consumers of NPR , you may have recently heard the voice of Ira Glass urging you to text the word “LIFE” to a particular number in order to contribute $5 to the show’s operating costs (“perhaps from the very device you’re currently listening to the show on,” he points out). The show doubled its number of donations using this tactic. Our own Seattle Theater Group recently tried the same thing for their “Sign of the Times” campaign by asking show-goers to text the word “sign”, automatically donating $5 to the cause. They managed to raise $3500 this way. It seems that people are having a good deal of luck utilizing text messaging as a means to raise funds for their causes. The internet has created - as researcher Kirk Snyder calls it – an “Age of Awareness” among the younger set. It’s made the world a smaller place and brought concepts that were previously off most young people’s radar, to the forefront of their minds. And though the information age may create a sense of overwhelm, or rewire our brains in detrimental ways, it also creates an opportunity to mobilize and educate in a big, big way. I’m not suggesting that web 2.0, and other forms of technology are the be-all end-all of social activism, but they are an important tool in our toolbox, as a means to get people out to marches, and to disseminate information with a wider net. Perhaps one of the most telling statements in some recent Pew Research Center findings on characteristics of 19 to 29-year-olds is this statement: “They embrace multiple modes of self-expression.” They also happen to list use of technology and music/pop culture as the top two defining characteristics of their generation. So let me suggest this: Millennials are not lazy; they are different. So instead of admonishing them for not embracing their parents’ means of creating social change, how about we come to them on their terms, using the language of text message, interactive web, and social media.